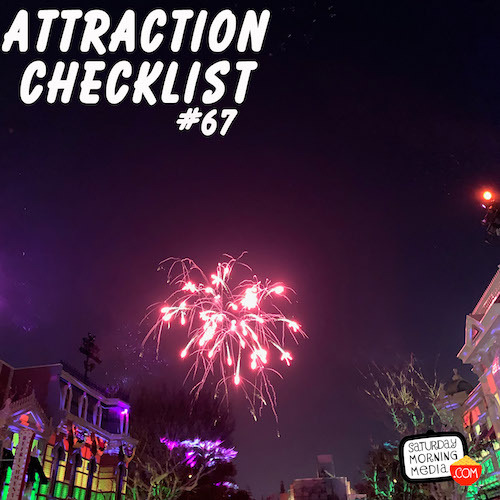 http://www.attractionchecklist.com – Join Suzie and Grant as they visit Disneyland to watch and review the new nighttime spectacular Mickey’s Mix Magic! With fireworks! Recorded on February 7, 2019. This episode finds us at Disneyland to check out the park’s newest piece of nighttime entertainment, Mickey’s Mix Magic! Disneyland’s website says: Light up the night at this new, high-energy show celebrating Disney’s legendary duo Mickey and Minnie Mouse! Before we hear DJ Mickey spin some tunes, here are five fast facts about Mickey’s Mix Magic at Disneyland Park. 1. Mickey’s Mix Magic officially debuted at Disneyland on January 18, 2019. 2. There are three viewing areas for the show, Main Street U.S.A., the facade of It’s A Small World and water projection screens on the Rivers of America. Each of these locations has custom projection designs promising a slightly different experience in each location. 3. It’s interesting to note that the show will not feature fireworks every single performance. The show was written as a projection show with fireworks adding enhancement to the proceedings on select nights only. On the night the audio for this episode was recorded, there were fireworks. 4. The show uses more that 2 dozen video projectors and 14 of those projectors are on Main Street USA! 5. The song featured in the show, It’s a Good Time by the Deekompressors, was written especially for Mickey’s Mix Magic. Now it’s time to celebrate Mickey Mouse with Mickey’s Mix Magic. Suzie was with me the night I recorded this and, even though she snuck off to get an ice cream during the show, her and I discuss the show after the audio. This is a binaural recording so if you have headphones put them on now as we experience Mickey’s Mix Magic at Disneyland!